Add the chia seeds, sweetener and almond milk to jars and stir. Place in the fridge to set. It’s ready to go in just about 30 minutes, but you could leave it overnight if you want. Remove from fridge, top off with passionfruit, a sprinkle of coconut flakes and a scoop of coconut yogurt. I put mine back in the fridge to let the passionfruit soak the yogurt and chia pudding. Add the chia seeds, sweetener and coconut milk to a jars and stir. Remove from fridge, top off with fresh strawberries, a sprinkle of coconut flakes and a scoop of coyo. Beat ingredients together and pour runny mixture onto low-medium heated fry pan greased with coconut oil. Make like a pancake, flip when golden brown on one side and small bubbles come to surface. Make sure you cook long enough as otherwise will break on flipping. Experiment with toppings. Berries and a dash of organic maple syrup is always yummy but experiment with what your personal tastes are! 1. Preheat oven to 160 degrees (fan forced oven) and line muffin pan with baking cups. 2. In large bowl, whisk together flour, salt, and baking soda, taking care to break up any large clumps of flour. 3. In medium bowl, whisk together eggs, coconut oil/ghee/butter, smashed banana, vanilla and lemon oil, juice and zest, then thoroughly combine wet ingredients with the dry. Fold in blueberries and chia seeds. 4. Divide batter between 12 muffin moulds, filling each three-quarters. Bake for 25 to 30 minutes, or until tops turn deep golden brown. Blend ingredients together in nutribullet, pour into cup and enjoy! Prepare to get a lot done today. Beat ingredients together and pour runny mixture onto low-medium heated fry pan greased with coconut oil. Make like a pancake, flip when golden brown on one side and small bubbles come to surface. Add some colour and texture with your favourite toppings! Fresh raspberries, chopped banana , a tablespoon of melted nut butter or a sprinkle of cacao nibs! 1 tbs vanilla extract and I needed 8 drops pure liquid stevia to sweeten but this is depending on your taste buds! Please use your unrefined Sweetener of choice eg some like a tablespoon of maple etc. Blend ingredients together and pour into serving containers. Will take 1 - 2 hours to set. Serve with berries, shredded coconut, and nuts and seeds (optional), and enjoy! 1. Beat ingredients together and pour runny mixture onto low-medium heated fry pan greased with coconut oil. Make like a pancake, flip when golden brown on one side and small bubbles come to surface. Experiment with toppings. Cacao Nibs, melted nut butter, fresh berries! Blitz until creamy and spread on loaf. Add ingredients to mashed banana and pour into lined loaf tray. Bake in preheated oven at 170 degrees fan forced for 50 minutes. Slice strawberries and line , then devour! Sweetener of choice: I use around 4-6 drops pure liquid stevia but this depends on your taste buds just ensure you use unrefined sweetener eg tablespoon of maple etc. Toppings: Sliced banana , Berries, Diced mango, passionfruit, coconut, nuts and seeds! Blend coyo, coconut milk, frozen banana together as if you were making a smoothie. Add the chia seeds, give a few pulses to mix them in through the smoothie, but so as not to completely demolish them. You can also just stir them in if you prefer. Pour into a serving bowl or jar, refrigerate for a minimum of 20 mins before serving! 1. Beat ingredients together and pour runny mixture onto low-medium heated fry pan greased with coconut oil. Make like a pancake, flip when golden brown on one side and small bubbles come to surface. NB: it is important to use the mix straight away to avoid it going gluggy. Double the mixture if you want to make extra for leftovers! 1. Mix all dry ingredients in bowl and coat with coconut oil. Spread out on an oven tray and roast for 20 minutes at about 150 degrees until golden brown. 2. 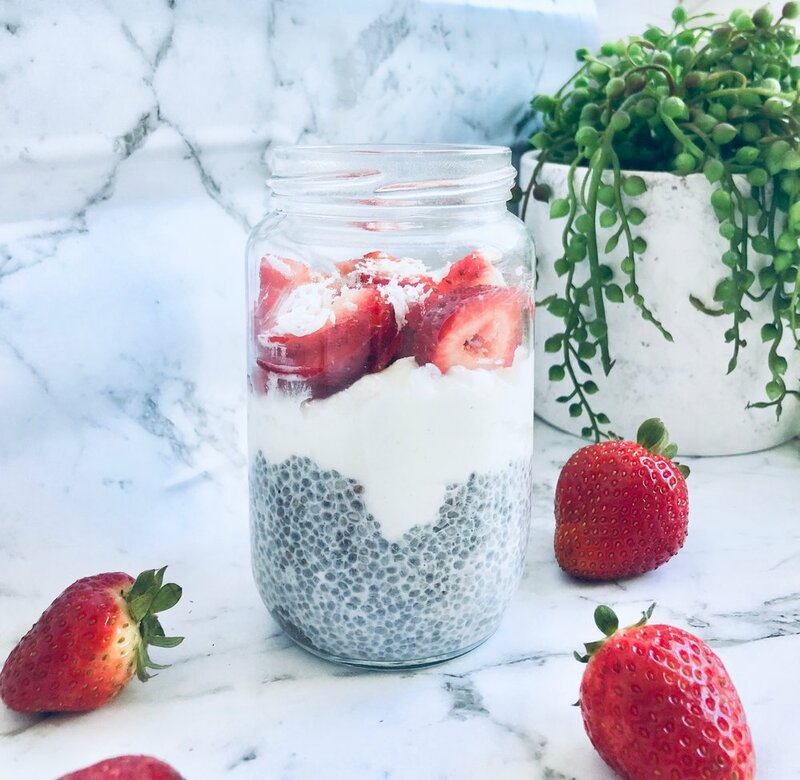 When you eat, add plain yoghurt (if tolerated), almond milk and some grated apple or berries is always yummy but experiment with what your personal tastes are! Note: You can add gluten free, organic rolled oats if desired. Beat ingredients together and pour runny mixture onto low-medium heated fry pan greased with coconut oil. Make like a pancake, flip when golden brown on one side and small bubbles come to surface. Experiment with toppings (scoop of coyo, sprinkle of chia seed or maybe some Hello Happy Granola. Optional: 12 slices very good quality smoked ham or bacon. If using bacon remove rind. 1. Preheat oven to 180 degrees and either grease with coconut oil/butter or line muffin pan with squares of baking paper. 3. In large bowl, lightly whisk eggs, parsley, cumin, salt and milk. 5. Divide egg mix between 12 muffin moulds. 6. Bake for 25 minutes, until ham/bacon is crisp and egg is just set. 7. Enjoy as a meal or snack and be happy – these are so delicious! 1. Either roughly chop nuts or pulse in food processor, pulse nuts until they are grainy. Then, divide into two jars or containers. 2. Add chia seeds, ground flax, sweetner, vanilla, sea salt and coconut milk to jar. Stir to combine everything. Cover and place in the fridge overnight or until it sets. 3. You can enjoy cold or reheated then add all the toppings! Enjoy! Line a loaf tin with baking paper or grease with coconut oil. Blend all the ingredients in a food processor until you have a smooth dough. Press it into the prepared tin and bake for 45 minutes until it is cooked through. Leave it to cool, then take out of the tin and cut into slices. Freezing in individual slices is handy! As this is a dense bread it’s so delicious toasted, perhaps with some butter or avocado and salt- yummy!